Dreaming of beautiful tropical beaches, lush rainforest, exotic wildlife and outdoor adventures? It’s time you visit Santa Teresa, Costa Rica. Cala Luxury Vacation Homes has your home in paradise ready for you. Choose from our spectacular and luxurious family vacation rentals, our beachfront tropical villa Calista, or our charming Los Almendros beach bungalows – all front and center on breathtaking Playa Santa Teresa. All of our full-service vacation home rentals feature a personal concierge, on-site housekeeper and private chef. This newly constructed, luxury 4-bedroom villa is nicely located in a luscious hilltop estate offering you a special experience by blending luxury with convenience and nature. 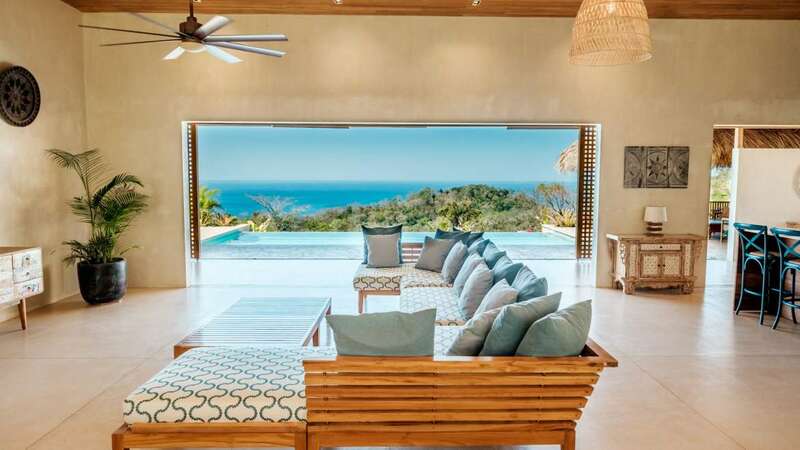 Villa Divina offers stunning panoramic views of both the ocean and the jungle. Some of the amenities it offers are the infinity pool, high-speed internet, a ping pong table, a fully equipped open air kitchen and living room, and 4 master bedrooms each with private bathrooms and closets. To not mention our favorite feature, a cozy outdoor rancho with a great BBQ grill, perfect to take a break from the sun while still enjoying breathtaking ocean views and those famous Costa Rican sunsets. Villa Divina’s location is also very special because you are away from the dust and noise of the town, while having the best possible views, and yet it’s only a 6 minutes drive from Santa Teresa’s famous surf beach, restaurants and fun.